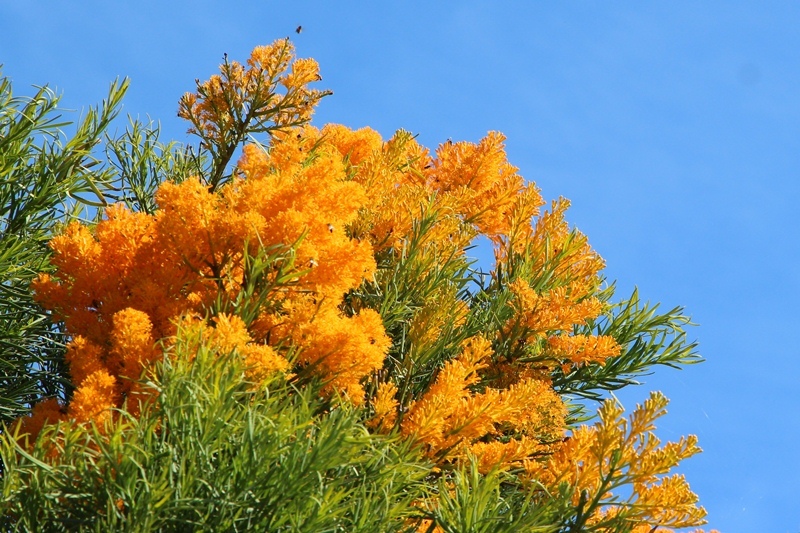 The West Australian Christmas Tree (Nuytsia floribunda) is the largest mistletoe in the world. It is an obligate root photosynthetic hemiparasite – which means it cannot complete its lifecycle without a host, but it does photosynthesise and just obtains water and mineral nutrients from the host plant. It parasites roots of lots of plants up to 50m away rather than the stem of an individual plant. 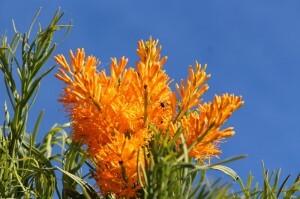 It can grow up to 10m tall and flowers from October to December – hence the name. 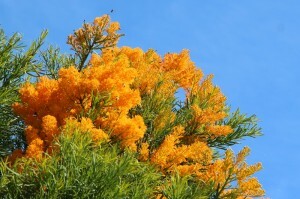 Initially buds are yellowy-green, but as they mature, they go bright orange. The brightness of the flowers will vary from day to day depending on sunlight intensity. This photo was taken on a 38 Deg C day. We only have one specimen on the road reserve beside the property and would love to have more, but they are easy to propagate, but notoriously difficult to bring to maturity, only surviving for a couple of years. Young trees will only flower after burning in a bushfire.